A sinkhole closed the northbound off-ramp from Interstate 805 to Kearny Villa Road in Serra Mesa on Monday morning. 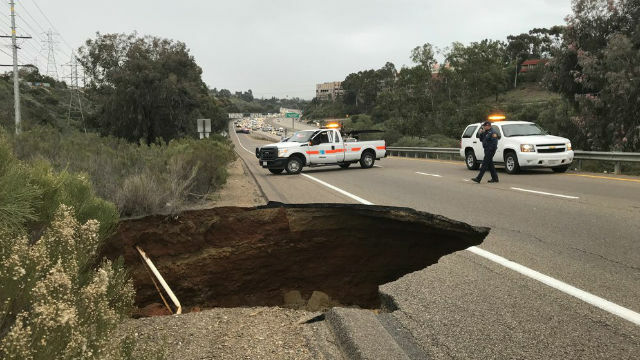 The ramp was closed due to a roughly 10-foot by 20-foot sinkhole that was encroaching onto the roadway, according to the California Highway Patrol. The sinkhole opened up shortly after 9 a.m. as another winter storm began to drop rain on the already saturated San Diego area. Caltrans said the off-ramp would remain closed through the Tuesday evening commute. The agency said rain was slowing repair work.